The trail begins at the Windy Joe/Pacific Crest Trail (PCT) trailhead, located 1km off Hwy 3 on the Gibson Pass (Lightning Lake) Road. does not afford spectacular panoramic vistas until reaching its summit, it does have a variety of flora and fauna to keep visitors intrigued. runs dry near the end of a hot summer. When leaving the camp, the trail descends in a southwesterly direction providing great views and a wide variety of flowers (June and July). Soon after the end of the descent, the trail crosses Castle Creek to the Castle Creek wilderness campsite - at 12.5 km. 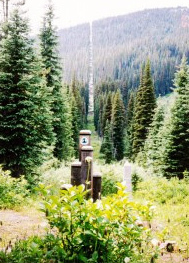 The border at Monument 78 is another 500 m south along the trail. Stop here, or continue on to Mexico, over 3700 km away! The majority of PCT hikers start at the Mexican border in late May or early June and arrive in Canada in late September or October. Due to heavy snowfall, extreme avalanche conditions and exist on this trail. Hikers going into the United States are recommended to wait until early July. For information check with BC Parks and the US Forest Service (Winthrop). Firearms ARE NOT PERMITTED in E. C. Manning Provincial Park. Anyone wishing crossing the border should contact both US and Canadian immigration for information on the procedures to do so. Both the Canadian and US border services have occasionally posted immigration/border personnel in this area of the PCT crossing. Failure to provide the proper documentation could result in fines and/or indefinite entry suspension. Everyone entering the United States must do so at a point of entry. The nearest point of entry is the Sumas Border crossing west of E. C. Manning Park. US Customs indicates that anyone southbound on the PCT is required to cross at the nearest point of entry. Failure to report in may result in arrest. Everyone entering Canada must contact Canadian Immigration before entering. Canadian Customs requires that you obtain written permission to enter Canada but there is also the requirement to report to the nearest Customs Point of Entry and Immigration office. The Greyhound bus only has scheduled passenger pickup at Manning Park Lodge. Here is the general Greyhound inquiry number. (1-800-661-8747). We wish you a safe and memorable hike along the PCT!